If you own a Samsung Galaxy Chat, you are in for a update to 4.1.2 Jelly Bean. Samsung has started rolling out the update for Galaxy Chat users in India. As per mobile related website mobigyaan, the Samsung Galaxy Chat has received a Android 4.1.2 Jelly Bean update to base firmware B5330XXUBMD2. However please note the update is a huge 322 MB in size so you require a Wi-fi connection. 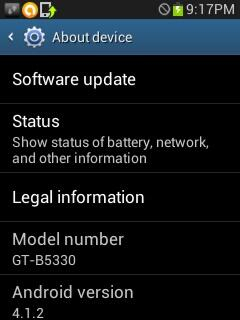 The update can be done through Samsung Kies or Over the Air (OTA). With this update, the Galaxy Chat users can have access to Google Now besides host of other features which include smoother and faster UI, a new enhanced notification panel which the users can edit to incorporate their own shortcuts. Please click on OS update link to know the latest updates for your mobiles. Please write in your comments on this article.